Dave Cantin is a sought-after mergers and acquisitions expert, speaker, self-made entrepreneur and philanthropist. Dave’s career in the automotive industry spans over 20 years. His passion and dedication to exploring innovative sales opportunities led him in taking a small local car dealership to become one of the largest single-point car dealerships in the world. Since selling the dealership in 2015, Dave regularly consults on mergers and acquisitions in the auto space and beyond. He has extensive knowledge in analyzing evaluations and helping negotiate a complete M&A transaction. Dave’s specialty is representing platform acquisitions, overseeing multiple dealerships within an individual deal. In 2017, Dave closed the second largest auto M&A in U.S. history, involving Prime Motor Group, which included over 30 dealerships. Dave, thank you for doing this. Please give us a little background about your story. I was born and raised in Freehold Township, New Jersey, the youngest of three children. My father left us when I was nine years old, and my older brothers were already out of the house. My mother worked in real estate, but was devastated and battled severe depression for my entire childhood. We didn’t have much money and a majority of the time it was just my mother and me. I was pretty much alone so I had to quickly learn how to take care of myself. I learned how to self-motivate at nine years old. I learned quickly that I had to make things happen. Although I was initially upset and angry when my dad left, I realized that no good would come of it and I turned that anger into positive energy to focus. At an early age, I knew that I wanted to become an entrepreneur, I wanted to own my own business, to make my own money and control my own destiny. My last two years at Freehold Township High School, I joined a program that allowed me to spend half of the school day working. I got a job at Nordstrom’s, selling women’s shoes. The women loved me and I fell in love with sales. I quit the day before graduation and the next day I looked in the Asbury Park Press classified for jobs and ad read “Unlimited Income. Car Sales”. I knew this was the job I wanted. I walked into Freehold Hyundai with a newspaper rolled up under my arm, with the ad circled. I was ready to make my first million. He said I was too young and had no experience. But instead of walking out that door, I turned around and exclaimed, ‘you just lost the best thing that’s ever walked into this dealership’ and I refused to leave until he interviewed me. Four hours later he relented. He interviewed me and 10 minutes later offered me a job. His name was Greg Covino and he became my first mentor. We keep in touch to this day. He taught me about the value of a solid work ethic. Six months after I was hired I was their top salesman. Two years later I was the general sales manager. By the time I was 20 I was making over $350,000 a year and I felt I had nothing left to accomplish there. It was time to move on. That’s when I became a partner with ex-New York Giant lineman Brad Benson and Brad Benson Hyundai in Monmouth, NJ. I started off as GM with the understanding that I would be a partner within a year. As the new GM, I called a meeting the next day and told everyone, ‘I have good news and I have bad news. The bad news is everyone here is fired. The good news is as of right now I’m taking applications.’ In the end, I kept roughly half of the 49 employees. But over the next several years we grew to over 200 employees. During my 16 years with Brad Benson I helped develop the dealership into one of the largest volume single-point dealerships in the country. I did so by treating it as if it was my own home. The service department opened an hour before the sales department but I still beat every service guy there every day and was the last person to leave. But there came a time where it was time to stop acting like it was my place and find a business of my own. It was time to move on and in 2014 I sold my share of the dealership. We paid someone to sell our dealership and I realized how lucrative the auto acquisition world was and decided I wanted to try my hand in that arena. I researched the half a dozen or so organizations that specialized in automotive mergers and acquisitions and National Business Brokers stood out. In 2014, I joined NBB. Three years later, in 2017, I forged the second-largest auto dealer acquisition in U.S. history with Prime Motor Group, consisting of over 30 dealerships. It was second only to Berkshire Hathaway’s 2014 acquisition of Van Tuyl. That’s when I decided to focus on pursuing my next big goal — creating the largest M&A firm in the U.S., and doing so by providing expertise, consulting, and connecting buyer and sellers, whether other dealers or private equity firms. That’s how, in December 2017, DCG was started. I hired the right team of motivated experts and in its first year DCG became the country’s fastest growing M&A firm. DCG completed 2018 with 39 acquisition listings valued at more than $1.5 billion. What were some of the greatest challenges you faced personally and professionally to get to where you are today? I have learned that life has many challenges and unexpected events that you cannot control, and success and happiness all have to do with worrying about what you can control and focusing on the positive. Being from a broken home and enduring a tough childhood was a substantial challenge in many ways. I had no father figure, no family around, and didn’t have what many other kids had — including food at times. It was easy to often ask, ‘why me?’ and be angry. But I learned how to overcome and think positive. I learned how to forgive and focus. In business, my biggest challenge was surviving the 2008 recession and the auto bailouts. The auto industry took such a hit and no one wanted to buy a car. Even people who had leases were begging the banks to extend their lease simply to avoid the fees of signing a new lease. People were scared of getting a pink slip, of losing a dollar. I called a meeting with my entire sales force, I said we have two choices. We can focus on what’s going on outside these four walls, and fall into a state of depression and be sad or we can focus on what’s going on inside these four walls, pump the music up, put some smiles on our faces, and we can get creative. It all starts with how people feel the second they walk onto the sales room floor. Whenever we greet someone we need to act like we just got a raise or our wife just had a baby. We need to let them feel and touch that excitement. Of course, that was nothing compared to the challenge I faced a few years later. In 2011, I was feeling lethargic and out of sorts, so I went to my doctor and learned that I had chronic myeloid leukemia, an aggressive cancer that attacks your bone marrow. I always lived a healthy lifestyle. I did not drink alcohol or take drugs. I worked out regularly, I watched what I ate. So, when the doctor told me I had leukemia, I was floored. After the initial shock, I attacked cancer with the same fervor I’ve brought to every challenge in my life. I was told I would probably be in the hospital for three months. I checked myself out barely two weeks later. I went through chemotherapy on and off for five years. But I’m happy to say that I have been cancer free for two years. How did surviving cancer impact your life and business, and did you see the world differently as a result of your experience? I am thankful; thankful for each day, for everyone in my life and everything I have achieved. It may sound trite, but being diagnosed with cancer made me realize that there are no guarantees, that anything can happen at any minute. It made me work harder at living life to the fullest and at nurturing relationships with those I love. It also impacted my approach to business and my desire to give back. It made me laser focused on pursuing my vision, my dream. And it made me selfish of my own time, and disciplined to focus on what matters and what makes a difference. This in turn made me work harder to become more efficient, which benefited me, my loved ones — who had more time to spend with me — and my team and clients. I have also dedicated to giving back as much as I can to help others. 4. How did you choose the automobile industry — what part of it resonated with you? Passion. I always loved cars and I was eager to pursue a high-paying career and eventually I just fell in love with the automobile industry. I grew my career from it. But more so, I Iove helping people, building relationships, partnering, mentoring, and nurturing these relationships toward a goal. M&A is all of these pieces, and then some, including always figuring out the best solution by overcoming any obstacles and putting all the pieces of the puzzle together. A key part of it is pulling all parties together, via collaboration and communication. It’s the excitement of all the above and the challenge to deliver success. For doing so, you can also be rewarded well. This enables me to do what I love and most importantly give back. 5. What role do you think philanthropy should play in the life of an entrepreneur or business person? How do you find the causes that you support? When you reach a certain level of success, where you have the financial wherewithal to be philanthropic and you have the reach to encourage others to do so, I think it is incumbent upon you to find a cause to get behind. I’m very fortunate to be where I am, to have achieved what I have achieved and I feel compelled, obligated even, to make something positive come out of my battle with cancer. I think we all should give back. Our philanthropic causes, helping others, giving selflessly — that’s our legacy — not how much money we have in the bank when we die. I will do some sort of giving and working the rest of my life. Since my diagnosis in 2011, I have helped raise over $150 million to fight pediatric cancer via various companies and charities, among them, I served as vice chairman of Hyundai Hope on Wheels and Project Ladybug, which donates to three nonprofits including St. Joseph’s Regional Hospital in Paterson, New Jersey, Memorial Sloan-Kettering in New York, and Comer Children’s Hospital in Chicago. A percentage of every DCG transaction goes to a charitable organization fighting pediatric cancer in the community for the acquired dealership or company. Our goal at DCG for 2019 is to donate a half-million dollars, and within a few years I hope we eclipse $1 million annually in donations to fight this horrible disease. 6. How has the automobile industry changed over the course of your career and what are your thoughts on it? So much has changed and continues to change. We are witnessing electric cars, autonomous cars, ride-sharing, online shopping and sales, and how dealerships and brands are marketing and selling, even automated purchases similar to a candy machine. This all impacts dealerships. Additionally, there are more restrictions and requirements from manufacturers, and the public companies and larger conglomerates or groups that impact the traditional smaller, mom & pop, single-point dealerships and smaller groups. The market dynamics make it more difficult for the smaller guy to compete. What we’re seeing today are disproportionately larger groups doing the buying, and private equity and investments are entering the space. It’s rare for a family member to take over the family business nowadays, so protecting the dealer legacy is different. 7. How has your enthusiasm for your career changed over time? I am more enthusiastic than ever. It’s interesting because I am at a point in my life that I am very fortunate and happy for what I have achieved — a level of success both professionally and personally — where it could be easy to take a breath and just enjoy it. But at the same time, I have the feeling I have just begun and there are so many more, exciting opportunities and events ahead. 8. What advice would you give the twenty year old version of yourself that you wished you had known? When I was younger and not mature in the business world I was a know-it-all entrepreneur. I made a lot of irrational decisions in my 20s. If there was a problem I would instantly try to fix it, I would try to make a decision in 30 seconds. Today, I would tell my 20-something self to disengage from an issue or a problem, to step away for a while, put some thought into it then come back with a fresh look, re-engage and conquer it. Few good decisions are made in haste. 9. What are you the most proud of? My children. I am most proud of my children. They are my top priority and make me most happy. And, that I am happy. I am at a point in my life that I am truly happy. I have achieved a level of success enabling me to give back, a business that I’m passion about, that is helping people, and its success will continue to give back to organizations and causes I am dedicated to helping. 10. What’s the vision for DCG? Why and how? My vision is for DCG to become a leading global consulting and M&A firm. 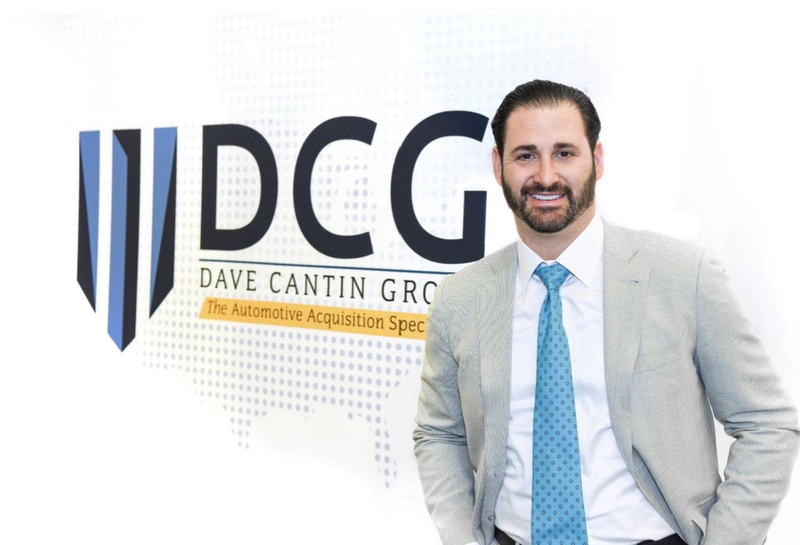 In our first year we already established DCG as the fastest growing and leading auto dealership M&A firm in the U.S. and we are already fast tracking to hit our 2019 goal of over 50 acquisition listings for over $2 billion. This was achieved with a dedicated and motivated team of well experienced experts, all focused on providing the consulting expertise and partnership desired in the marketplace. We are now gearing up to expand our footprint and services beyond automotive dealerships. As such we will continue to expand our team with the best experts. Still, there is much left to achieve. And, I am not sure until I get there but I will figure it out along the way. Whatever it may be it will be something I am passionate about. Did you hear about the classic Corvette everyone wanted to buy, but no one wanted to keep?